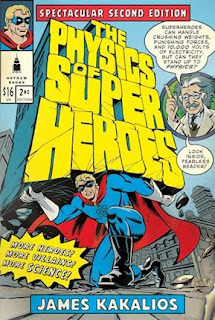 Physics Buzz: The Story Behind The Physics of Superheroes! James Kakalios knows that he will be forever linked to the physics of Spiderman. When he started teaching a freshman seminar class in 2001 based on the physics of superheroes, he had little inkling that it would soon lead to a whole series of popular lectures, a popular book, and even a gig consulting on a major Hollywood motion picture. He jokes frequently that even if he were to win three Nobel Prizes, the photo of him surrounded by action figures would be his legacy. There is of course more to Kakalios than caped crusaders and comic books. In addition to teaching and directing undergraduate studies at the University of Minnesota, he is also a condensed matter experimentalist. His work in disordered systems extends from the properties of amorphous semiconductors to neurological systems and the avalanche dynamics of sand. Kakalios’s book The Physics of Superheroes originated from an impulse and momentum problem he included on exams nearly fifteen years ago. He asked his students to calculate how much force Spiderman would need to save his girlfriend Gwen Stacey after the nefarious Green Goblin sent her plummeting off the Brooklyn Bridge. 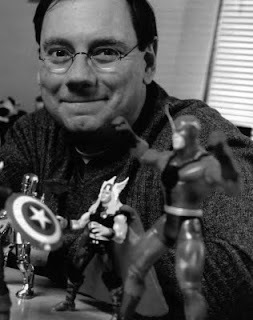 Kakalios began incorporating more pop culture references in his physics lectures until in 2001 he started teaching a freshman seminar class title “Everything I Know About Science I Learned from Reading Comic Books.” In the class every diagram and example Kakalios used was borrowed directly from the pages of comic books. The class required students to break down complex problems into their constituent parts and creatively solve them. Instead of a final exam Kakalios had students pick a character from a comic book and do a scientific analysis of them. Students would come up with original approaches like calculating how many calories the Flash needed to run hundreds of miles an hour. One student used the curve of the Earth in a single panel to extrapolate the height of an airplane flown by a cartoon mouse. Kakalios found that many of his students enrolled in the course weren’t regular comic book readers, and most were from majors outside of the sciences, like history and journalism. They were people who had enjoyed physics in high school and had wanted to learn more but were intimidated by it. When the Spiderman movie came out in 2002, Kakalios penned an editorial for the Minneapolis Star Tribune based on his original exam question about Spiderman’s imperiled girlfriend. After his editorial ran, other publications began to take notice of his novel method of teaching physics. The timing coincided with a slew of new feature films based on comic books, so news started to travel fast. The Associated Press profiled him which carried his story around the world. Other news outlets started to contact Kakalios as well, including CNN Headline News and the BBC. Soon after, Gotham Books approached Kakalios to write a book based on his seminar course. In 2005 The Physics of Superheroes hit store shelves with Discover Magazine naming it one of the top science books of the year. Now in its eleventh printing, the book has been translated into German, Italian and Spanish, with Greek and Korean versions in the works. The book takes its readers on a superhero guided tour of physics; starting with fundamental forces and motion then working up through thermodynamics, electricity, general relativity, and finally some fundamental quantum mechanics. To make it as accessible as possible, Kakalios intersperses humor with the hard science and opted to focus on the numerous instances where comic books get their physics correct rather than the many times they don’t. The book’s popularity attracted the attention of Hollywood. In 2007 Ann Merchant, the deputy executive director of communications at the National Academies, asked Kakalios to act as the science advisor for the big-screen adaption of the popular “Watchmen” graphic novel. Kakalios advised the production company on ways to help create a believable fantasy in the film. Actor Billy Crudup, who played the physicist turned superhero Dr. Manhattan, said that talking science with Kakalios helped him get into character. The studio also helped Kakalios produce a series of “The Science of Watchmen” video clips. To date these videos have been downloaded from YouTube over 1.5 million times. Kakalios recently completed an updated edition of his book, now out. The new version expands the original book to include the fluid dynamics of Aquaman, the angular momentum of the Human Top, and the material science of the members of the Justice League of America. “I did all the calculations and now the jokes are 12.7 percent funnier,” Kakalios said. In addition, Kakalios is writing a new book on the importance of quantum mechanics in everyday devices like CD players and cell phones. Even if his new book is as popular as The Physics of Superheroes, Kakalios still plans to attend comic conventions across the country.